•	Mild to moderate lymphedema. •	Mild to moderate lipedema. 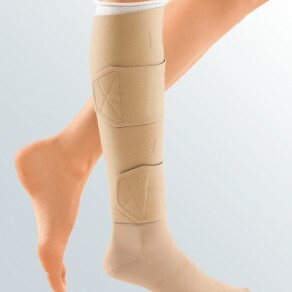 •	Compression (20-30, 30-40, 40-50 mmHg). •	built-in pressure system™ (BPS™) guide card provides targeted compression ranges for improved results. •	SILVERtec™ added to prevent static, odor and propagation of bacteria in the garment. •	Simple measuring & sizing – 8 sizes & 2 lengths. •	Circaid® Juxtalite™ lower leg system includes 1 legging, 1 pair of compression anklets, 1 undersleeve (footless), and 1 built-in pressure system™ (BPS™) guide card. •	Does not include Circaid® power added compression band™ (Pac band™) or Juxtalite™ ankle foot wrap. Must be purchased separately.